How ancient is your PC? Take a minute to let the PC Age Calculator determine just how much of a relic your computer really is. Share the results of this six-question quiz for a chance to win a free Samsung SSD Calculate your PC’s age and share the results on Facebook. You could win a Samsung SSD. 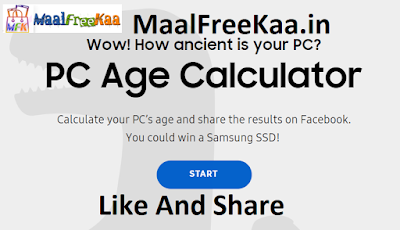 Participate Now To PC Age Calculator Contest and win Samsung SSD. 1. There is no charge for entering this Promotion. You must have access to the Internet as the Promotion can only be entered online. 2. To enter this Promotion, during the Promotion Period, go to PC Age calculator webpage and take a yes/no quiz on the event page. 3. Share your results on Facebook along with the hashtag #PCAgeCalculator in the description and @SamsungSSD tagged in the post. 4. Once submitted, the provided information and uploaded photo will be considered a Participant's Entry. Samsung SSD 860 QVO (30uniits), 970 EVO Plus (20units) will be given to each of the 50 winners. Delivery of the prizes will start after the the winner is announced and the prizes will be shipped from 5/4/2019. Prizes will be awarded and provided on an "AS IS" basis with no warranty or guarantee whatsoever, either express or implied. Nothing contained herein should be construed as an endorsement by Samsung of any prize suppliers or other third party, product, or service. No cash or other substitution, assignment or transfer of any prizes permitted, except by Samsung, who reserves the right to substitute a prize or prize component with cash or another prize of comparable or greater value. All prizes are subject to change without prior notice. Note that only personal Facebook accounts are eligible for prizes. Your post must be set to public and include #PCAgeCalculator and tag Samsung SSD in the description. Multiple entries are allowed, but only one prize can be awarded per person. Winning posts must remain active and public for 3 months in order to receive a prize. This promotion is subject to change without prior notice. Once submitted, the provided information and uploaded photo will be considered a Participant's Entry. All winners will be announced Mar 29th on the official Samsung Memory Facebook page (@SamsungSSD).